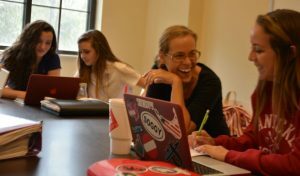 Senior Amanda Hinson spends her last days connecting with faculty, including Mrs. Wilhelmsen, while Taylor Upchurch spends some of her time with her younger sister Jordan Upchurch. The Knightly News conducted a survey to find out what the Class of 2017 is most grateful for with regard to their time spent at Pace. In the top category, 17.95% of the 39 responders are most grateful for good friends. Coming in second, 12.82% of the seniors are most grateful for great teachers. In a four-way tie at 10.26%, those responding are grateful for a loving and supporting community, ICGL trips, happy memories, and a safe place to grow as a person. Seniors are also grateful for a great education, at 7.69%. Beyond that are good food, athletics/teammates, getting into their desired college, and developing a passion for something. It is a time of mixed feelings for many. Senior Michael Chen is heading to Washington University of St. Louis for fall semester. “I’m really excited to begin the next chapter of my life in St. Louis, but also extremely sad about leaving my friends at Pace, people I’ve known since sixth grade,” he said. The Class of 2017 will be heading to colleges as close by as Emory University and Georgia Institute of Technology and as far away as the University of St. Andrews in Scotland. Seniors have been accepted to top schools such as Harvard, Princeton, Dartmouth, University of Pennsylvania, Stanford University and University of Chicago. Thirteen seniors are headed to schools to pursue athletics along with academics. These include students playing football, basketball, volleyball, soccer, baseball, golf and swimming at the college level.